“…eminent climate scientist…” among whom? The most accurate forecaster in Kansas City rarely goes out beyond ten days, and every year he has a contest for the public to take a cash prize predicting the first snowfall day. Its just an article of common knowledge among the populace here that the weather can and will change at any time, and next year’s seasonal behavior is just as unlike the recent past, as is the daily weather predictions.. We live from day to day, and season to season. Over the last 20 years of life here I’ve seen the climate shift from warm winters and hot days in the peak of summer to erratic and extreme cold temperatures in winter, late Spring by 2-3 weeks, with an increase in peak flooding. I’d like to know how anyone can successfully model that. The instrumental data in the graph appears to go up to 2009. I’ve seen a version going up to 2013 that uses Hadcrut3. We’re now a decade beyond 2009 so you really need to source an updated version or not use this 2009 version or use it and say it goes to 2009 with some indication of the instrumental record data after 2009. Too many inter-dependent variables. Believing a minor trace gas matters more than anything else is absurd and foolish, but that’s where we are. That wouldn’t work locally or in the short term but would be accurate over the long term. If we don’t know ECS then we cannot model the climate if CO2 plays any significant role. They insist radiative factors are the biggest deal in the models, then wonder why they always come out too warm? Not hard to see where the main problem lies. The engineer’s at Boeing wish the science of aviation was as settled as the climate consensus believers claim climate science is. Oldbrew, agree with your point that the basics of climate are not well known but there are a couple of points which are known but the so-called “climate scientists” do not understand or deliberately ignore. 1/ CO2 in our atmosphere based on well known engineering formulae based on measurements has no significant temperature absorbing or holding affect. 2/ changes in CO2 concentrations in the atmosphere lag changes to atmospheric temperature ( therefore in practice can not be a cause) 3/ clouds made of water droplets and ice particles affect incoming radiation from the sun 4/ water vapour (H2O gas) unlike CO2 (due to its concentration and its wavelength absorption and emission ability) has an affect on atmospheric temperatures 5/ the evaporation of water from ocean, sea and lakes, and the condensation of water vapour to liquid and solid forms in clouds also has significant temperature effects. Just considering the 4 points above clearly shows so-called “climate change” due to CO2 especially resulting from human activities is a scam. Thanks for updating the graph. Check the model results, then compare with the observations – the scientific method, no matter how ’eminent’ you are. 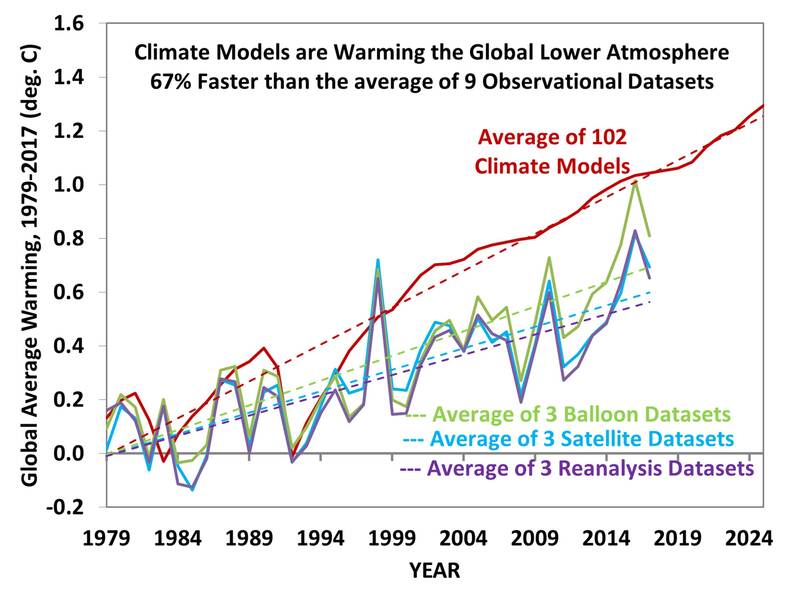 In Consensus Climate Science™, when 126 of 126, 111 of 114, 42 of 49… modeled projections are wrong, or when the opposite sign of the modeled trend is observed, the climate models are still regarded as mechanistically correct, especially with regard to the CO2 climate influence. And this is exactly the problem. Who is really in denial? They keep getting the same wrong answers from the models but plough on regardless, or so it seems.